8.27.2013 I was sifting through our trays of old jewelry and found this lovely large locket I thought I could put to good use. But inside was a lock of someone's hair. Now what... it feels like a bit of a desecration not to preserve it as is. It had me a little spooked for some reason. 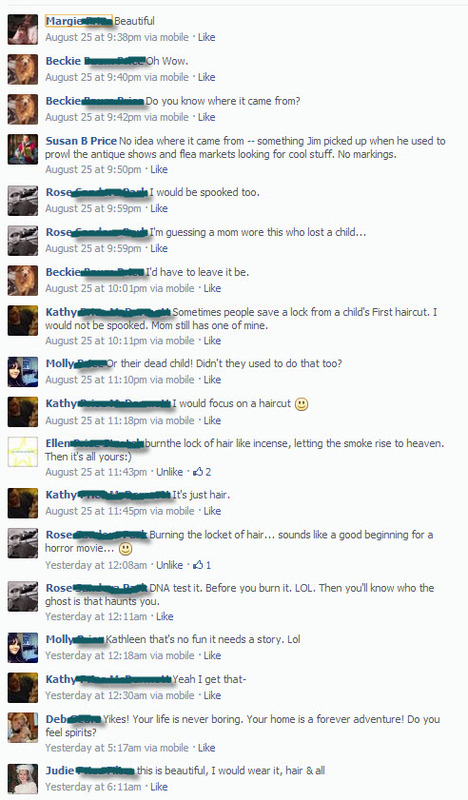 I posted these pictures on Facebook. For some reason, it was one of those postings that drew a lot of comments (see below)... maybe because it is both beautiful and mysterious, with a touch of creepiness. Will this item remain a mystery or can I make any inferences at all from it? 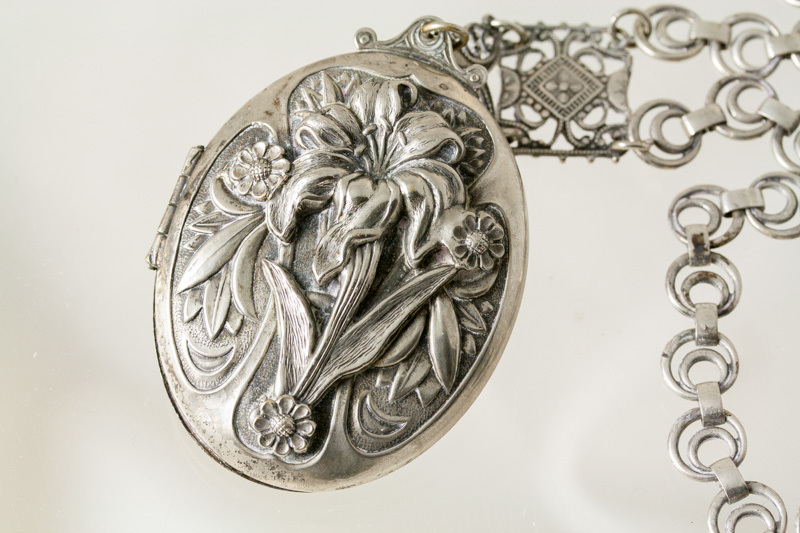 The hinged locket is large -- 2 inches long, with a day lily floral pattern, plain on the back. It has no markings. It is not sterling -- more likely silver plate and mass produced. The locket dangles from a decorative chain but is attached by a simple jumpring -- so no evidence that they belong together. The inner bezels and hinge of the locket are worn and oxidized; the compartments are lined with blue leatherette and the covers are clear plastic [celluloid? ], not glass. So I'd say it was owned by a middle-class woman. Lockets and the Art of Mourning. The 1860s brought the Civil War in the US, and the death of Prince Albert in England. Death became a part of the zeitgeist, as lead by England’s Queen Victoria, who went into a state of perpetual mourning when her beloved husband Albert died. Lockets became a popular way to honor the dead and keep their memory close. 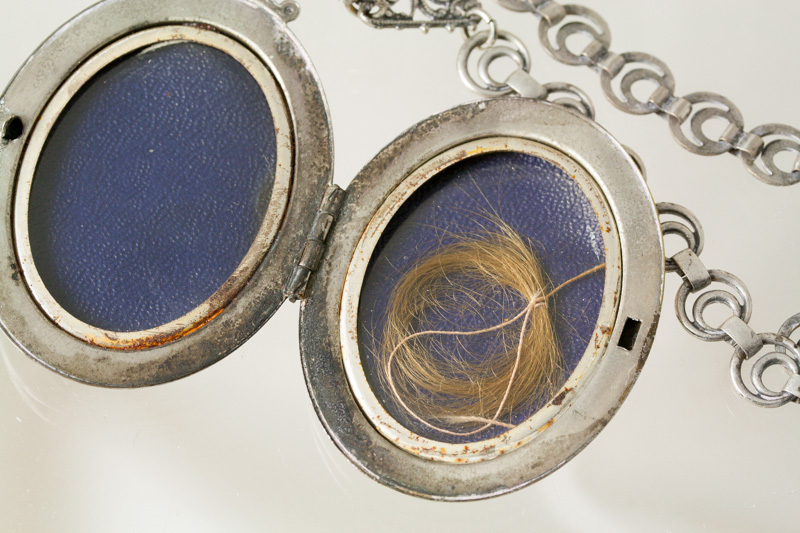 Lockets were often carried with a photo of the deceased and/or a lock of hair inside. It goes on to say that the turn-of-the-century lockets were smaller and known as "sweetheart" lockets. The reference also leads me to think that the lock of hair represents mourning -- maybe a child, maybe a sweetheart -- someone whose white-blond hair had time to turn auburn -- but someone's whose death was untimely since no photo was available for the other side. So, if I were into seances (and Lilydale is only a couple hours away), I would try to contact this woman of sorrows and ask her who she mourns.